I have been attending weddings for over 14 years now and each and every couple leave a little imprint in a section of my brain, I love leaving with a smile “tooting” our wonderful musical horns waving goodbye and telling their story to another bride to be. The heavens generously poured out blessings to consecrate this amazing beginning. On the greatest day of their lives, Amanda and Joseph could not have asked for more. A beautiful spell of rain seemed intentionally planned to wipe away the staleness and summon that perfect ambiance all around. Planning your very own wedding is not as difficult as it seems. In fact, you can DIY most parts of your special day easily with the help of your family and friends. 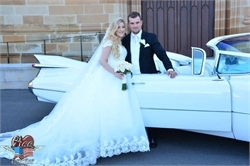 For a classic wedding in Sydney, you need not spend your entire fortune by getting the service of professional organisers and hiring expensive suppliers. 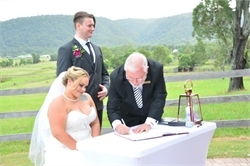 Planning a traditional wedding may look easy at first because everything about the wedding has already been tried and tested for generations. There is also less effort on trying creative things. 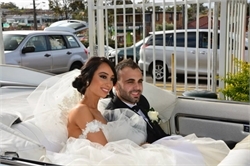 But the problem starts when you are trying to organise everything about the special day, from the food to the vintage car hire Sydney service. 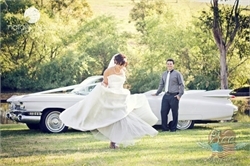 Have you ever dreamed of riding to your wedding in a classic convertible? Imagine making wedding memories like no other with a dashing convertible by your side. Be it a photo prop or renting it for their entire wedding ceremony, a Cadillac is like a cherry on top of the most special day of your life. Rijdia and Ieden had an entertaining wedding reception that everyone in attendance will remember for a long time. And all the special moments were caught on camera by the boys from Golden Touch Productions. 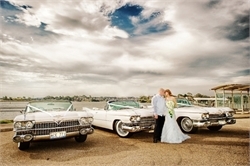 Why Choose Our Wedding Car Hire Service? 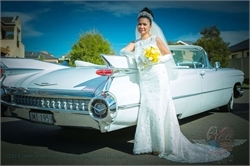 The 1959 Cadillac is just one of those things that can leave a lasting impression and using one on your special day will definitely make your journey to forever truly memorable.